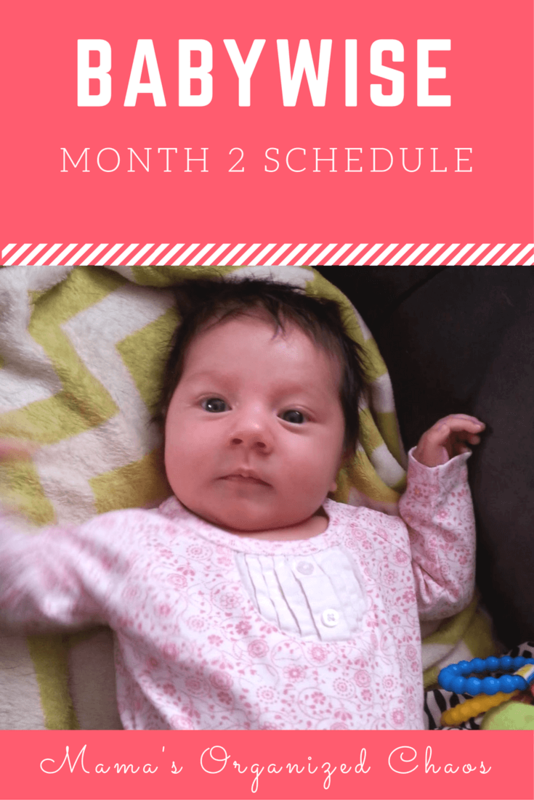 Babywise schedule month 2: for a baby around 2 months of age. On this page you’ll find schedules, information on naps, nighttime sleep, and more! At this point you will have established a fairly consistent schedule. My main goal during this second month was to get baby to sleep for naps WHERE she was supposed to be sleeping. In other words…not in my arms! At 6 weeks I recommend moving your baby into her crib for nighttime. This will actually help all of you sleep better. This will also help you to start to establish a bedtime routine as well as nap routines. I suggest keeping the bedtime routine simple and short. We decided on feeding, then changing her diaper, changing her into bedtime clothes, swaddling, closing the curtains, turning on white noise, and turning the lights out. We would then at this age rock, bounce, walk back and forth (whatever your baby likes) to get her to sleep. Naps for us had been all over the place, so during weeks 3 and 4 I held Caroline in order to get her to sleep WHEN she was supposed to be sleeping. Now that I had her on a reliable schedule it was time to move her to WHERE she was supposed to be sleeping. Do not do this step until your baby is sleeping WHEN she is supposed to be sleeping for naps first. Once they have that down, it is time to lay them in their crib for naps. I chose to do a shortened version of our bedtime routine for naps. Babies will learn what the routine is trying to tell them. They form sleep associations with whatever you do that works! Caroline now knows, that if we go in her room, and I turn the lights off, close the curtains, and put her in her swaddle, that it is time to sleep. Babies go through growth spurts, wonder weeks…all sort of developmental leaps. So you may feel as if you take a step backwards in your schedule. We ended up adding an extra feed this month during the day, and she also started waking 2x at night instead of 1. Something else we are struggling with is cradle cap. It doesn’t seem to bother her at all, but I notice it! We’ve tried some natural remedies to help cradle cap, and seen some success with the nice brush! I did this in order to “fill her up” so she might last longer at night.This is 7 feedings, 3 hours apart. Notice that in the evening I chose to cluster feed. This is a series of feedings close together right before bedtime. Others choose to do a dream feed…but that never worked well for us and I have not heard many success stories with that method. We did eat wake sleep cycles for all but the cluster feeds. She only slept after the 6:30pm feed, then we kept her up from 8pm to 9pm and put her to bed after the 9pm feeding. Wake time should include lots of tummy time at this age! Also start letting your baby have at least 1 cycle of wake time where she plays independently. Stay close by, but let her learn to entertain herself. You will be amazed at how well your baby does without you! 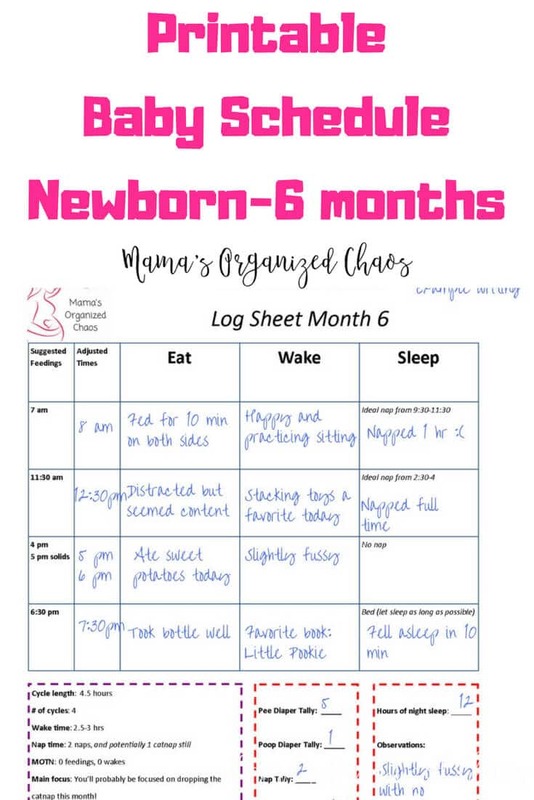 Vary the wake time activities… one cycle might be independent floor time, then the next tummy time, then the next some time in the swing, or go for a walk, etc. Nap time at this age should be the focus. Start having your baby take naps in her crib at the right time. At week 6 transition baby into sleeping in her crib. MOTN wakes may be more frequent than the last couple have been. Try to get baby back to sleep. If you go through all of the above steps, and your baby is still crying, then go ahead and feed them. I always went through this checklist so that baby didn’t get reliant on eating in order to sleep. If you take the time to do this hard work now, your baby will sleep longer at night very quickly! We finally had naps on schedule, and we were focusing on having naps in her crib. We started cluster feeding because she was waking an extra time at night. She was content with 7 feedings and was waking twice at night. 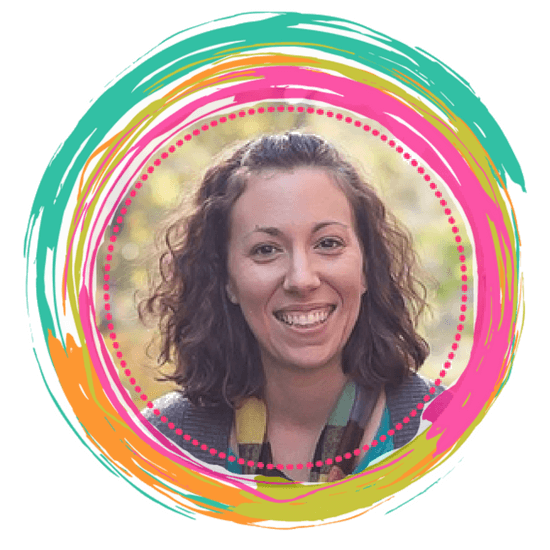 About 2 weeks into this month, Caroline was consistently waking up twice at night. The second time she woke she was refusing to go back to sleep unless we co-slept and held her. We gave in simply to get some rest! After 2 weeks of this, however, I was worried that I was creating a bad habit. So I decided to try a method called wake to sleep that I had read about. The idea is that you go in about an hour before a MOTN (middle of the night) wake. You barely touch your baby ONCE! Wait to make sure your baby moves. This will be a sign that you have disrupted a sleep cycle. The idea is that their sleep cycle will start over, and they will be able to sleep longer. We did this for about 4/5 nights and were able to eliminate the second MOTN waking all together!